What Was The First Song Encoded Into MP3 Format? The Driest Desert On Earth Is Located In? In the early 1980s, German electrical engineering doctoral candidate Karlheinz Brandenburg was working on his dissertation. The focus of his research was digital audio encoding and perceptual measurement techniques—research that would go on to become the basis for the digital music revolution and the ubiquitous MP3 format. To test the quality of the compression algorithms he was crafting, he focused on human vocals. Instrumental music compresses fairly well, but the human ear is highly tuned to detect irregularities in the human voice. Brandenburg was confident that any compression algorithm that could successfully compress the human voice without problems would handle everything else thrown at it just fine. In order to test his algorithms, he selected the 1987 a cappella version of the hit Tom’s Diner by Suzanne Vega as, in his words, “I knew it would be nearly impossible to compress this warm a cappella voice.” He used her voice as a benchmark and refined the algorithms so that not only could they compress instrumental work, but preserve the warmth of human vocals too. 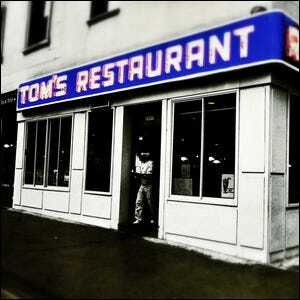 As a result of Brandenburg’s extensive use of Tom’s Diner to test audio compression techniques, modern audio engineers informally refer to the song as “The Mother of the MP3”. Bonus trivia: Vega called it Tom’s Diner, but she was inspired by the famous New York City restaurant Tom’s Restaurant, seen here, which was near where she grew up in NYC.